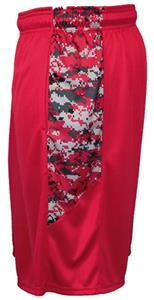 Badger Sport Digital Camo Panel Performance Shorts. 100% Polyester moisture management/antimicrobial performance fabric. Sublimated digital side inserts. 2'' Covered elastic waistband & drawcord. Two deep side pockets - Double-needle hem. Badger heat seal logo on left hip. Waist (on the half) 14.25" 15.25" 16.25" 17.25" 18.25" 19.25" 20.25"
Inseam 7" 7" 7" 7"
Waist (on the half) 9.5" 10.5" 11.5" 12.5"
Camouflage pattern may differ from picture and may vary from item to item. Great quality will defiantly order again!